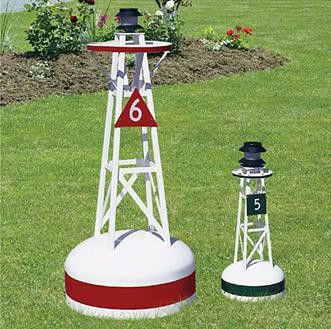 Hey all of you nautical enthusiasts, check out our Amish handcrafted lawn buoy. Made with a fiberglass bottom and a vinyl top, our buoy is made to withstand all weather conditions. Choose from Red or Green. It comes with a solar powered light and can be placed anywhere in the sun. It includes 2 powder coated anchors to anchor it in place. Choose even numbers 2,4,6, or 8 in red or odd numbers 1,3,5,7, or 9 in Green. Quality and Customer Satisfaction are our number one goals in every lighthouse and buoy we produce and we offer a variety of styles to suit your taste. Please e-mail us if you have any questions. Small Buoy 28" H x 13"